A recent report from the RAND Corp. is likely to drive that conversation. It finds that under the right conditions, a single-payer system could insure every New Yorker, while reducing overall health spending and shifting funds from insurance administrators and bill collectors to actual services. It also makes it clear that a lot of things could cloud the conditions needed to support the system—which would add an estimated $139 billion in new taxes in 2022—and that New York would be particularly vulnerable adopting single payer in isolation. Assemblyman Richard Gottfried (D-Manhattan), who has been championing the New York Health Act since the 1990s, insists it’s up to individual states to lead the charge. “I think having one or two states enact a state program is the best way to get national legislation done,” he said. Robbins said she is taking seriously the potential challenges and roadblocks the RAND report lays out. Do they spell doom for the New York Health Act or should they simply be the starting point for a more in-depth policy discussion? The RAND report’s analysis of the single-payer model is based on the assumption that the state will get waivers to redirect federal funds that currently go towards Medicare, Medicaid, and subsidies for Obamacare plans, to the new single-payer system. The Trump administration has made it clear that it would not provide any such waivers in service of single-payer. Medicaid is state-run, so the state could just continue to track who is eligible for it in order to keep getting reimbursed by the federal government. But Medicare, the health program for the elderly, is federally run and funded. The other option, according to Gottfried, is for everyone on Medicare to keep their current insurance and simply build the single-payer system around it. “In a world of computers it is easy to run the New York Health Act as a wraparound to Medicare,” Gottfried said. While RAND didn’t analyze this scenario, RAND study author Jodi Liu said it could undermine the efficiencies—and savings—the single-payer system is supposed to generate. Given that it aims to kick the entire health insurance industry out of New York—a lucrative market that the large national insurer Centene recently paid $3.75 billion to enter through its purchase of the local insurer Fidelis Care—the New York Health Act is bound to face fierce opposition. But there’s at least one legal challenge that could render it null and void even if it’s successful. The New York Health Act would require businesses to pay a portion of each employee’s payroll taxes to support the single-payer system, which is intended to replace the employee health benefits they would otherwise pay for. Typically, it’s large companies that are “self-insured,” meaning they take on financial risk for covering employee health benefits and have greater control over their plans. Allowing employees of those companies to continue on their employer-sponsored plans would not be part of the single-payer vision in which everyone’s plan pays health care providers at the same rates and affords the same access to care. Although federal courts have determined that states were violating ERISA for what appear to be far more minor demands of employers in relation to health benefits than New York’s single-payer bill, Moglia, the RAND authors, and the health experts at Manatt, Phelps & Phillips all said there’s no clear precedent for what the outcome would be in this case. The RAND report finds that employers that currently provide coverage would see their health costs go down, on average, under the New York Health Act, but employers have been largely silent on the single-payer model so far, and the Business Council of New York State, which represents about 2,400 companies and trade organizations, is fighting against it. The group maintains the dramatic tax increases would drive businesses out of New York or scare them away. “I would never argue there aren’t employers that might financially benefit from this system but I think on average and overall they would suffer greatly,” said Lev Ginsberg, a lawyer and lobbyist for the Business Council, who said the group is working to form a coalition of doctors, employers and nonprofits to oppose the New York Health Act. Funding for health care under the New York Health Act would come from existing state and federal funds as well as new payroll taxes and taxes on income such as capital gains. The taxes would replace the money New Yorkers currently pay towards health care through monthly insurance premiums and out-of-pocket fees such as deductibles and copays. In true redistributionist fashion, the bill calls for the taxes to go up incrementally so that the rich pay a larger share of their income towards health care. Under the sample tax model used in the RAND report—which is likely not the final tax model lawmakers would settle on&mdashNew Yorkers in the top fifth percentile of earners would see their health care payments increase from about 23 percent of their compensation to about 35 percent of their compensation in 2022, or an average of $50,200 more per person. The RAND report raises the concern that if too high a burden is placed on the rich, particularly in New York where the tax burden is already high, they could leave the state en masse or find other ways to avoid paying taxes, upending the tax structure. New York being alone in single-payer land would exacerbate the risk of migration to surrounding states, the report noted. According to RAND, “if the wealthiest 0.5 percent of tax filers left the state or found other ways to avoid payment, annual revenue from the NYH non-payroll tax would decline by about $33.5 billion in 2022, which represents about 11 percent of the total cost of NYH.” Those wealthiest 0.5 percent represent around 50,000 tax filers. Gottfried is dismissive of the threat of tax migration. “I have families in my district who own not only one $13,000 Hermes leather shoulder bag but several of them, each in a different color and those families are not going to be driven out of New York by New York Health Act taxes,” he said, referring to his 75th District, which includes parts of Chelsea, Hell’s Kitchen and Midtown. Gottfried emphasized that his tax model would diverge significantly from RAND’s, but did not make any promises to try to take some of the burden off the super rich. Nothing so far truly rules out the state’s ability to implement the New York Health Act, although some issues raise the question of how much advocates are willing to compromise or risk to get a version of it through. But that just means lawmakers and the public have a raft of complex concerns consider, all of which will be complicated further by the efforts of special interest groups to influence the conversation. 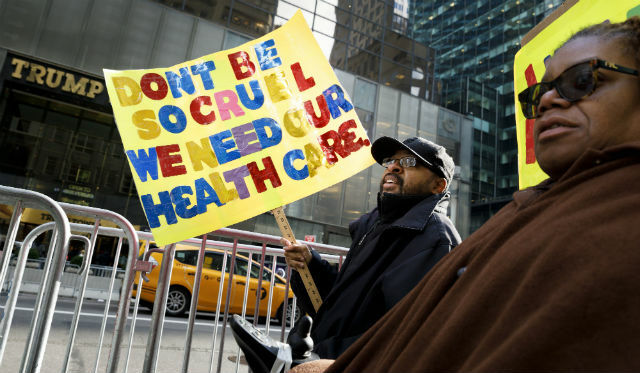 Would the New York Health Act have a net positive or negative effect on jobs? Would the state really be able to drive down growth in health care spending without squeezing health care providers or sacrificing services? How bad would the wait times be? Are the promises of a single-payer system—such as not worrying about whether the individual doctor who treated you at the hospital when you were sick was in your network—worth the inherent risks of radical change? Governor Cuomo has yet to take a position on the bill, although Gottfried says the governor is taking a close look at the RAND report. But those campaigning on the New York Health Act in the upcoming state elections are more gung-ho than ever. Caroline Lewis is a Brooklyn-based freelancer mostly covering health care and drugs for outlets including the Village Voice and Crain’s New York Business.